Failure to implement an effective central equine database in Britain would be a grave mistake, World Horse Welfare chief executive Roly Owers says. 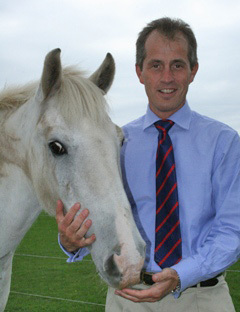 Owers, addressing delegates at this week’s World Horse Welfare Conference in London, said: “Perhaps one of the greatest challenges we face in Europe, most certainly in the UK, is implementing an effective system to identify all of our equines, as having a reliable way to link every horse to an accountable owner is the very foundation of protecting our horses. “Cows have it, sheep have it; we must have it for horses. “This is where an effective central equine database plays a fundamental role. Given the current austerity climate, there is a risk that the government will only support a status-quo database, fulfilling only the minimum requirements and ignoring the lessons we have learned from the past. Owers said one of the best developed horse-human partnerships was in sport, where regulators such as the FEI and the British Horseracing Authority rightly say that higher equine welfare standards are at the heart of their work. It was, he said, to their credit that these regulators engaged with independent organisations such as World Horse Welfare. “However, as I asked the FEI General Assembly last year, do national equestrian federations always place welfare at the heart of their strategy? “The temptation is to say yes, but if we are honest we might say: we could do better. “That is why it is good news that the FEI is undertaking a review of the part of the Dressage Stewards Manual that deals with training methods, and took the unprecedented step of suspending the Emirates Equestrian Federation this year over welfare concerns in international endurance. “Although the federation has since been reinstated into the FEI, serious concerns remain, including recent revelations of some very disturbing developments. “We have to remember that responsible horse sport dictates that the rules need to be enforced – rigorously, consistently and without fear or favour. Owers traversed a range of welfare issues around the globe, from elements of horse transportation to obesity and the way working horses, donkeys and mules are treated. Owers also questioned the long-term stabling of horses. “I do think we have to question how some of our horses and ponies are kept in stables for most of their lives, with an often cited justification that this protects them from accidents in the field. Is this really in the horse’s best interests? “We all know that horses need social contact and the freedom to just be horses. “And we can do things differently – for example, I was inspired to listen to the German international dressage rider Uta Graf speaking at last month’s Global Dressage Forum, showing how she lets her grand prix horses frolic in the field at home. He noted, too, the movements that supported the likes of non-restrictive nosebands, bitless bridles, and barefoot horses, to name but a few. Their supporters claimed improvements in horse welfare “and we cannot simply ignore them”. “We may not always like the way these movements try to engage, but their ideas deserve a fair hearing and consideration. Over the next decade a wealth of scientific evidence will be produced looking at all aspects of horse sport and their wider care, and we need to be leading, not reluctantly following, these findings. Owers said it had been a bad year for the charity sector, with months of negative media headlines surrounding charity fundraising. It had, he said, shaken the bedrock of trust on which all charities relied. “And whilst I have been dismayed by the failure of those who represent charities at a political level to stand up for the sector and the high standards that so many set, this is not a challenge we could ever ignore. Owers, concluding his address, said horsepower was still needed in so many different guises around the world. “And we need to use our own power to do more – with all of the expertise at our disposal, with all of the partnerships we can create, with all of the common ground we have – we have a duty, now, to challenge the status quo and do right for our horses.